Gaining new clients is a big challenge for any start-up business. You strive desperately to get your name out there and attract new leads with expensive marketing, branding and advertising. But your job isn’t done when the sale is made- it’s only just beginning. For long-term business success you need positive client retention rates, genuine brand loyalty and customers who sing your praises from the rooftops. You need to impress, charm and delight every person who walks through your door. How do you achieve this? With brilliant client relationship management, a top-notch relationship marketing strategy & software which delivers value to your clients. This chapter has everything you need to know. Client relationship management refers to a company’s interactions with clients, and their approach to building a positive working relationship. Good client relationship management helps to generate ongoing business, client retention and brand reputation. On the other hand, a poor approach to client relationship management can do immense harm to your growing business. Bad word of mouth spreads fast, and in our digital age it’s easier to publish a negative review than ever before. That’s why client relationship management is so important, especially for small businesses. 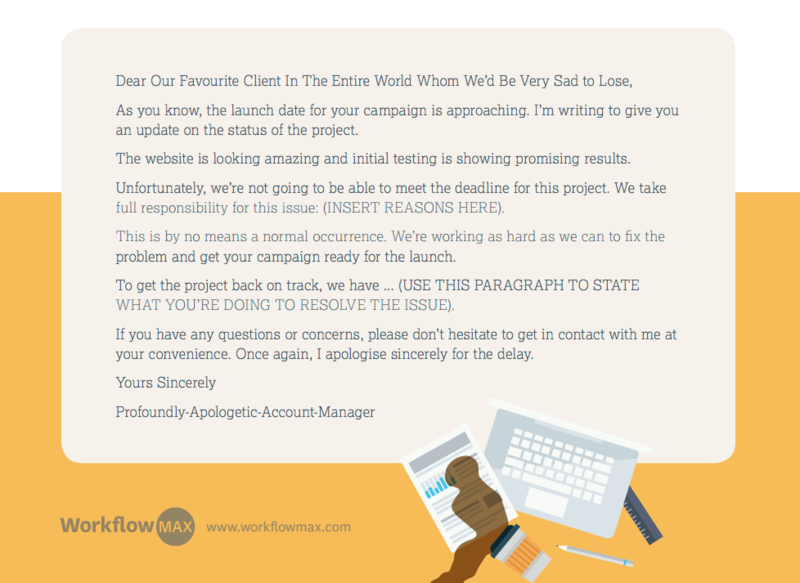 It’s also why the popularity of the WorkflowMax Client Manager (which lets you store all sorts of client information - from client birthdays to their favourite type of coffee) is booming. Learn 5 awesome ways job management software can support your client relationship management strategy. Relationship marketing is when you build awesome relationships with clients as part of your core sales strategy. It's a subset of client relationship management. Relationship marketing focuses on generating customer loyalty and long-term customer engagement. Put simply - it’s anything you do to keep your customers buying from you. When done well it leads to positive word of mouth referrals, brand loyalty, and free promotion. Relationship marketing is an especially powerful approach for service businesses. As a service business you don’t rely on transactional, instant sales… Instead clients need to trust in your work. Often they won’t know the full value of what you’ve done until the job is completed, possibly months later. This means you need to approach marketing in terms of client ‘lifecycles’ rather than isolated, one-off campaigns. Huge ROI. Many experts claim that increasing your customer retention by just 5% can increase profits from 25% - 95%. Repeat selling to existing clients is far more cost effective than finding new ones. Quality feedback. By building a strong relationship with your clients, you’ll have many opportunities to gather honest and insightful feedback. Then you can evolve your service to address their needs and become even more profitable. Word of mouth. People trust the opinions of their friends and family much more than anonymous advertising. Relationship marketing produces happy clients, who in turn bring in new business through personal referrals. Online reviews. By delighting your clients at every opportunity and cultivating long-term relationships with them, you’re more likely to get glowing reviews online. This will also help you attract new business. Unlike traditional advertising techniques, there’s no right or wrong way to do relationship marketing. And a downside is that it can be time consuming, even expensive. But there are definitely some affordable ways to delight clients - by establishing trust, setting clear expectations, delivering promises, and practicing good communication. How do you establish trust with a new client? What are the first steps towards a positive, long lasting relationship? As with any human connection, the most important thing you can do with a new client is establish trust. They need (and want) to feel confident that their project is in the right hands. This trust will set the tone for the whole project. If your client is confident in your abilities and trusts you to communicate honestly, they’re more likely to deal with problems in good faith. On the other hand if you seem insecure or dishonest, you’ll end up with a distrustful client who’s always looking over your shoulder. Even if you do great work. Share your previous work. Show the client your digital portfolio and similar projects you’ve worked on. Don’t be humble about previous successes - you want to come across as experienced, confident, and the right person for the job. Show them testimonials. What your previous clients have said about your work speaks volumes. If you have positive reviews use these to help build trust. Share them with your potential client as soon as you have the opportunity - it will help put their mind at ease. Communicate professionally. When sending those early emails make sure you write in a professional manner. It’s ok to be human and friendly, but don’t go overboard until it’s appropriate to your relationship. Use your social intuition and mirror their level of formality. Be honest and transparent. If you’re facing unique challenges - e.g. you haven’t done this type of work before, or you might encounter some delays, always be honest with your client. If you get caught in a lie even once, you’ll never rebuild that trust. The importance of these early interactions can’t be stressed enough. A great first impression sets you up for a happy client relationship and a successful project. Once the client is keen to get started you’ll need a well structured kickoff meeting - get your sample meeting agenda here. The first step to managing client expectations is getting everything in writing. You should have a contract signed which details all aspects of your project, timeframes and associated costs. You’ll also need an internal scope management plan. Chapter 3: Project Management & Planning has some great tips for keeping your team on track. Some clients will subconsciously (or deliberately) overlook contract details, and try to stretch the project scope. Some clients may not fully understand your resource limitations. Others simply get swept up in the excitement. Whatever the reason, often a client’s expectations will exceed what you can deliver. This means you must learn to push back against unreasonable client expectations - and do so in a tactful and professional manner. Managing expectations is a delicate process. You can’t say ‘yes’ to every client request and revision. Your team doesn’t have the time, resources or patience. But you can also run into trouble when automatically saying ‘no’ to everything outside the project scope. Professional consultant Pat Brans remembers what happened when he started pushing back too strongly. Brans said it was like ‘working in the dark’. His clients were intimidated by him saying no to requests, so they stopped communicating completely - and he ended up misinterpreting requirements or failing to understand their business issues. That's why it’s important to find the sweet spot when you manage client expectations. To do this you must distinguish between a reasonable client request and an unreasonable one. A reasonable client request is something that adds value to the finished outcome - perhaps a small tweak or a new approach you hadn’t thought of - which is easy to implement and doesn’t eat into your time and profits. Or an extra task they’re happy to pay for. An unreasonable client request is something that takes a considerable amount of time, lies outside your contract obligations, goes against your professional opinion, or won’t add value to the outcome. So what happens when you need to push back? Once you've determined the request is unreasonable, how do you respond to them? Saying no is always uncomfortable, even for the most seasoned account managers. It’s a conversation that needs to be done tactfully. If the client’s idea isn’t going to work, give them your expert opinion. Explain why it’s not beneficial to them and their business. Back your explanation up with previous examples - and remind them you have their best interests at heart. If their request lies outside the scope of the contract, point out the exact part of the agreement. Explain the cost of adding this work on, and what fees will be incurred based on the value of your time. If you simply don’t have the resources to fulfil their request; be honest. Explain why you don't have capacity - then offer helpful advice or alternatives based on their needs. If their request is going to delay another aspect of the project - explain this clearly. You might ask them to weigh up their priorities, and only go ahead if they’re willing to sacrifice a different component. It’s all about compromise. Managing client expectations requires careful consideration, and a calm nuanced approach. Sometimes you will compromise - other times it won’t be in your best interest. The most important thing is communicating the logic behind your decision. How do you give a client bad news? Even the best laid plans go wrong! There are many problems you might encounter during project completion. A sick employee, supplier delays, complicated jobs, IT problems, or even bad weather can cause major issues for some businesses. In these situations you have the uncomfortable task of telling the client their work will be delayed, or that results won’t be quite as expected. Open the conversation positively by restating the desired result, and the progress you’ve made so far. This reassures them that you’re still on the right track. Take full responsibility and ownership of the delay. Don’t vent or blame individuals on your team - personal mistakes are better kept internal. Be clear about the solution and how you’re going to make it better. Offer a discount or compensation if it’s appropriate. End the conversation with a new timeframe, edited contract or project scope. Tell the client you are still confident and committed to the project. When done well, delivering bad news can even improve your relationship with a client! Customers really appreciate it when you're honest, direct and dedicated to finding a solution. It helps to prove you're on their side. Want to know exactly what to say? Our FREE e-book 15 templates to keep clients happy is filled with gems like this, to make your life easier. Download your free copy now. How should you talk to angry or emotional clients? Often careful project management isn’t enough. You might have a personality clash with your client, or maybe you’ve made mistakes in the communication process. Sometimes the truth is they’re just a difficult person to work with. When tensions and emotions are running high it’s an unpleasant situation for everyone, including your client. Follow these steps to diffuse the situation. Step 1: Keep your cool... Always! This is the no. 1 rule to remember when dealing with a hot-headed client. Stay calm, and never let your own feelings spiral out of control. Responding to your client emotionally or angrily is only going to escalate the situation. Try not to take their anger as a personal offense. Your client could be under pressure from a tough boss, having personal problems at home, or just having an awful day. You never know their personal situation; so try to be empathetic. When someone is firing aggressive language at you, it’s tempting to roll your eyes. But disregarding a client’s feelings will only inflame them more. Sometimes just acknowledging their feelings will be enough to restore the calm. If you only focus on the point of disagreement, your client will feel like they’re banging their head against a brick wall. Finding points you agree on will help build empathy and understanding. You don’t want to be at loggerheads for the whole conversation. When tensions are running high it’s easy to get off topic, or end up discussing tangential details. To keep things on track bring a written agenda to the meeting. You should have all relevant paperwork at hand - your signed contract, previous written communication, and a timeline of events up to the present. Having these facts at hand will help you establish control of the conversation. If they ignore these written points, repeat them calmly until they sink in. You should never budge on facts! Always conclude the meeting with a concrete plan for moving forward, and email a summary of this to the client. This means the meeting outcome can’t be disputed. Include timeframes and specifics for moving forward. If you didn’t manage to reach agreement make sure you set a date for a follow-up meeting. It’s crucial to keep the momentum going. The longer any disagreement drags on, the more likely the client will complain publicly or leave negative reviews of your business. If worst comes to worst, you may need to cut your losses and cancel the contract. Bonus: Pay attention to red flags! The safest approach to avoid conflict is by recognising difficult clients early on. Then ask yourself whether it’s worth the time and stress. The worst clients may cost you money in the long run. It’s hard to say no to new business, but sometimes you need to trust your gut intuition. Asking for big discounts. A client trying to wrangle down your standard fixed rates is a bad sign. Do they respect the true value of your work? They’ll be trying to squeeze freebies out of you time and again. Vagueness. Sometimes a client can’t give you any solid details or requirements but still expects a quote. This means they’re not serious about the project, don’t know their own goals, or simply expect you to work miracles. Reluctance to pay a deposit. If you’ve explained your payment process but they’re reluctant or fidgety about paying a deposit, this is definitely a red flag. You’ll probably end up chasing invoices down the line. Your gut intuition. Sometimes it’s nothing specific they’ve said - just a knot in your stomach. In my experience this intuition is usually correct. If there’s something not quite right about the client, get out of there. Meeting with a client is a bit like dating - both parties need to make a positive impression. If you have concerns from the outset it’s a bad sign. Tell the client you don’t have the capacity to take them on, or you don’t think your services are suited to their needs. You’ll avoid a great deal of emotional stress, sleepless nights and heated phone calls in the future. What is a cost overrun? A cost overrun is when the actual cost of your project surpasses your original budget, estimate or quote. It can happen for a number of reasons. You might have underestimated the size and scope of the project. You might have encountered difficulties with suppliers, or human resources. Or the results didn’t go as expected the first time round. Whatever the cause of the cost overrun, often you find yourself in the uncomfortable position of needing more money from the client. When should you ask the client for more money? You’ve gone over budget...And now you have to tell the client. Gulp. It’s a tricky situation...and one project managers encounter time and again. When a cost overrun happens who foots the bill? Should your business absorb the extra costs (which could eat away your profits entirely) or does the client pay more? There’s no simple answer - but usually this will come down to what’s written in your contract. Your contract might include a fixed fee for cost overruns, to be added when necessary - or an hourly charge for extra work. Some contracts promise to pay 70% of the cost overrun, passing the remaining 30% onto the client. Other contracts require a full payment from the client, but the business will usually offer some form of compensation, like a discount on future work. Another reason why having a robust written contract is so important! For more information see Tiny budget, big dreams - How to tell your client you need more money. How can you prevent cost overruns? Whoever pays when there’s a cost overrun, no one wins. It’s an unpleasant, awkward, and frustrating situation for everyone involved. So how do you stop cost overruns from happening in the future? The most important part is learning from your previous mistakes. If a project suffers a serious budget overrun, make sure you do a post-project review and investigate what went wrong. Share these finding with your team and brainstorm ways to prevent it in the future. Document all of your mistakes so they can be learned from. Using a project management software like WorkflowMax can also to significantly reduce cost overruns. By tracking the billable hours of all your staff, and automatically weighing these up against supplier costs and budget, you can see at a glance if your job is running at a profit or loss. You can tell in real time how much money you’re making! It’s also easy to add notes to the job and communicate with your client, so any problems don’t catch them by surprise. WorkflowMax also makes it easy for you to estimate future jobs. By knowing at a glance how long similar projects have taken your team, you can generate quotes and estimates confidently. And accurate quoting makes the chance of a cost overrun much less likely. Head back to Chapter 3: Project Management & Planning for some more great tips on avoiding scope creep!